This package is designed to help with the easy integration of MIFARE Classic, Ultralight, DESFire and iClass technology cards into new or existing systems. Door access cards can be used in additional applications, such as: secure printing, cafeteria and machine vending, manufacturing process control & loyalty. Using the USB card reader, the Read-a-Card software retrieves the card's data (including the UID/CSN and other stored data) which can then be logged to a file, or automatically sent to other software applications using various methods (including simulating typed keyboard entry, commonly known as 'keyboard wedge' functionality). Advanced features include secure MIFARE sector and DESFire file reading and decoding, web application integration, NFC and custom format reading and data manipulation. Read-a-Card can also work with several card readers at the same time, identifying & logging the reader serial number alongside the details of the RFID card being read. Read-a-Card runs on a Windows PC. The kit includes the Omnikey 5021 CL USB smartcard reader with matching Read-a-Card e-license. 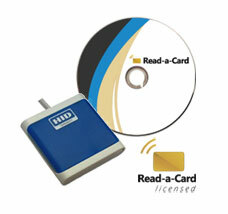 The Read-a-Card software is licensed to be used on any PC to which the supplied reader is directly connected. Read-a-Card provides the ability to decode customer-specific card data formats stored in MIFARE, DESFire and iClass cards, through the use of software templates or hardware security modules (SAMs) for holding encryption keys and other sensitive data. Using this mechanism, Read-a-Card enables the reading of customised formats and returns the relevant card data to other applications using its built-in keyboard wedge, file logging or direct integration APIs, without exposing the encoding scheme security data. Read-a-Card is compatible with a wide range of contactless readers from different manufacturers, and can be used to identify different RFID cards and tags, test reader functionality and to enable the use of multiple readers on a single PC. 1 Cannot determine card type but can read card ID. 2 No unique reader ID exists for this reader. 3 Firmware version 7 or higher required. 4 The NFC phones we have tested with are the Nokia 6131 and the Nexus S. The Nexus S by default will give a random ID for each time it is read. 5 The MIFARE cards we have tested with are 1K, 4K, Ultralight, Ultralight C, DESFire 4K, DESFire 8K EV1 and MIFARE Plus. 6 We have tested selected payWave cards from the UK and US. 7 Can read standard iClass formats including 26-bit, 32-bit, 37-bit and Corporate 1000. iClass Elite keys and custom formats are not supported by default. 1 Embedded licenses are pre-installed in the reader prior to shipping, and are signified by a 'Read-a-Card inside' sticker. 2 e-licenses are issued as a file, for customers that already have a suitable reader and can supply its serial number. If supported, Read-a-Card will automatically offer to embed the e-license in the associated reader. 3 The latest Omnikey drivers must be installed when using an embedded or e-license.